Developed for the most part in Great Britain and France, it was replaced by the pressurized water reactor, which performs better and is less expensive. 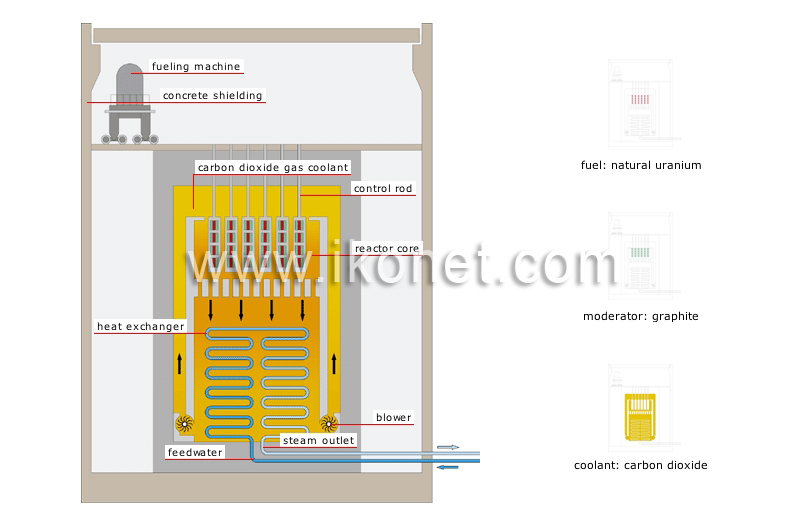 Carbon dioxide that recovers the heat from the reactor core and transfers it to the heat exchanger. Piping carries water from the condenser to the heat exchanger, where it is turned into steam. Water that has been vaporized in the carbon dioxide is carried to the turbine to produce electricity. Device that circulates carbon dioxide in the reactor core. Tubing system that is submerged in the hot carbon dioxide; here, water is turned into steam to power the turbine. Center section of the nuclear reactor where fission reactions take place. Tube that contains a neutron-absorbing material (boron, cadmium) that is introduced into the reactor core to control its power. Concrete structure that holds back radioactive products in the event of an accident. Natural uranium: fuel extracted from mines; it consists of a mixture of three uranium isotopes (uranium-234, -235 and -238). Carbon dioxide: gas that is heavier than air and is produced by burning graphite. Moderator: medium that slows the speed of the neutrons to maintain a continuous chain reaction.